Unlike previous seasons, the Bukta Away top differed quite a bit from the Home top design. The white Away top did have the embossed club crest throughout the material, but instead of the thick black strip on the shoulders and sleeves, there was only a thin black trim. The polo collar also differed slightly, with a more standard placket and button design, with a tangerine inset. The white on black Belhaven logo remained for a fourth season in a row. The top was usually accompanied by the Home kits black shorts, but was sometimes worn with white shorts, with a black strip down both sides, and white socks with black trim. The Away strip didn't make its first appearance until the 21st September 1991, when Duncan Ferguson scored in a 1-1 draw with Hearts at Tynecastle. As with the Home kit, the Bukta Away top’s time came to an abrupt end just two months into the second year of a two year deal, when the manufacturing firm could no longer supply the Club after facing bankruptcy. Forced to look elsewhere for a kit supplier, United eventually turned to another British manufacturer, Wolverhampton based Loki. Taking over in October 1992, the entire strip was kept as close as possible to the Bukta design for continuation purposes. 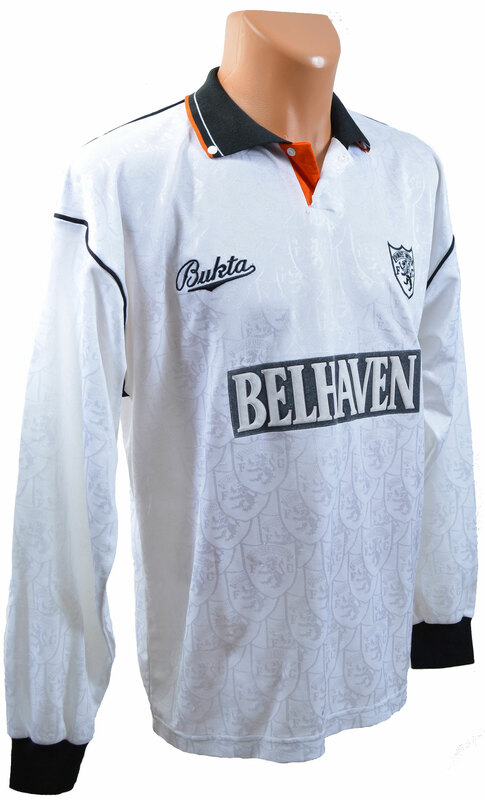 This was the sixth and final year with the Belhaven sponsor on the shirt, again with the white text on a black background. Again, the shorts and socks were kept as close to the Bukta design as possible. United finished in 4th spot in both the 1991/92 and 1992/93 seasons, qualifying for Europe once more in 1993 after a two year gap. The Away shirt was used in the usual trips to Fir Park, Tynecastle and Pittodrie on League duty, with one memorable match in the Away kit being the 1-0 win at Pittodrie, where Duncan Ferguson scored a late winner. This would turn out to be Jim McLean's last season as manager, after he decided to step aside after over 20 years in the job to concentrate on his role as Club Chairman.